RIO DE JANEIRO — The Senate voted overwhelmingly Wednesday to put suspended President Dilma Rousseff on trial, moving Brazil's first female leader a step closer to being permanently removed and underscoring her failure to change lawmakers' minds the last several months. After some 15 hours of debate, senators voted 59-21 to put her on trial for breaking fiscal rules in her managing of the federal budget. It was final step before a trial and vote on whether to definitively remove her from office, expected later this month. The political drama is playing out while Rio de Janeiro is hosting the Olympics, which run through Aug. 21. The outcome was widely expected: The Senate already voted in May to impeach and remove Rousseff from office for up to 180 days while the trial was prepared. Wednesday's vote underscored that efforts to remove her may have actually gained steam despite her attempts to woo senators who have expressed doubt about the governing ability of interim President Michel Temer, who was vice president under Rousseff. "No one can commit crimes with impunity," said Sen. Aecio Neves, a proponent of Rousseff's ouster. Senators pushing for her removal needed only a simple majority to require a trial. Not only did they get much more than that, they also garnered an ample margin over the super-majority — at least 54 — they will need to permanently remove her. "This is not an easy situation," Jose Eduardo Cardozo, the top legal official in Rousseff's now-suspended administration who is leading her defense, told Brazilian news portal G1 after the vote in the capital of Brasilia. Cardozo said that he would look at new appeals to the nation's top court and that several senators who voted in favor of a trial may be reluctant to take the heavier step of removing her from office. "In that way, the final vote isn't tethered to today's result," he said. Still, the situation does not look hopeful for Rousseff. Her appeals to the Supreme Federal Tribunal, the nation's top court, have failed, and attempts to rebuild her image with voters have apparently fallen short. Brazil's economy, the largest in Latin America, is mired in its worst depression in decades. Layoffs and late payments to some state workers have spurred deep anger. The country has also been struggling to confront the Zika virus, which causes birth defects in infants born to infected women and has ravaged thousands of families in poor, northeastern states. In another bid to head off the Senate trial, the ruling Workers' Party appealed for help from the Inter-American Commission on Human Rights. It was unclear what impact, if any, that would have. Temer, Rousseff's vice president-turned-nemesis, took over after her impeachment in May. He has been sharply criticized for appointing a Cabinet of all white men in a country where more than 50 percent of the population is non-white. Three of his ministers have been forced to resign for allegations related to corruption, and despite promises to get Congress moving after months of paralysis, he has struggled to push through reforms. Rousseff has repeatedly said she did nothing wrong and argued that other former presidents did similar things in their handling of the federal budget. She has argued that behind her removal are attempts to tamp down a wide-ranging corruption probe into billions of dollars in alleged kickbacks at state oil company Petrobras. Dozens of top businessmen and politicians have been jailed in the two-year investigation. While much of the graft happened during the 13 years her Workers' Party was in power, Rousseff repeatedly declined to do anything to squelch the investigation. She argued that the probe was badly needed in Brazil, where graft in politics is endemic. Investigators in the Petrobras case have said the company even had a department to handle bribes. Over the last several months, Rousseff and her aides have heavily courted several senators who they thought might change their minds. 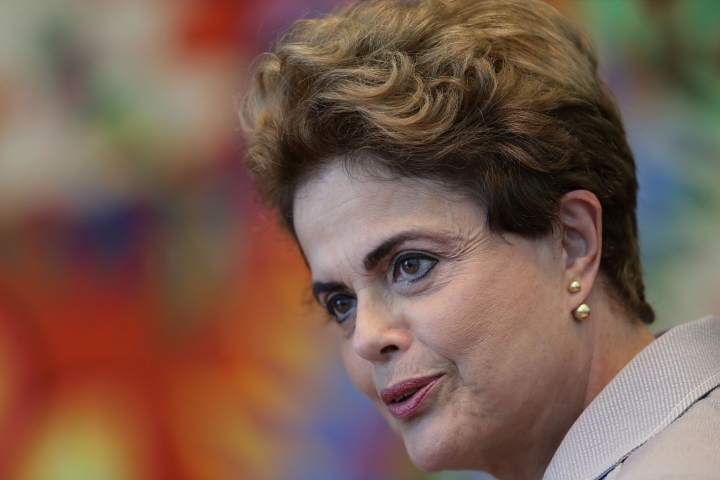 Rousseff, who has remained in the presidential palace, has also floated the possibility of calling new elections. In several interviews, she has said she would be open to a plebiscite. While those comments were widely seen as an attempt to persuade wavering senators to put her back in office, new elections before 2018 would be difficult. For that to happen, both Rousseff and Temer would have to be removed, or decide to resign from office. While Rousseff's fate looks to be all but decided, it's unlikely Temer would stand down. The 75-year-old career politician has said he would not run again in 2018, and in fact has little choice in the matter: The country's electoral court has banned him from running for election for eight years because of campaign finance violations.